Azusa, CA...sure, why not? I had a meeting in Azusa, CA. When I travel, I like to hit up the local burger spots. 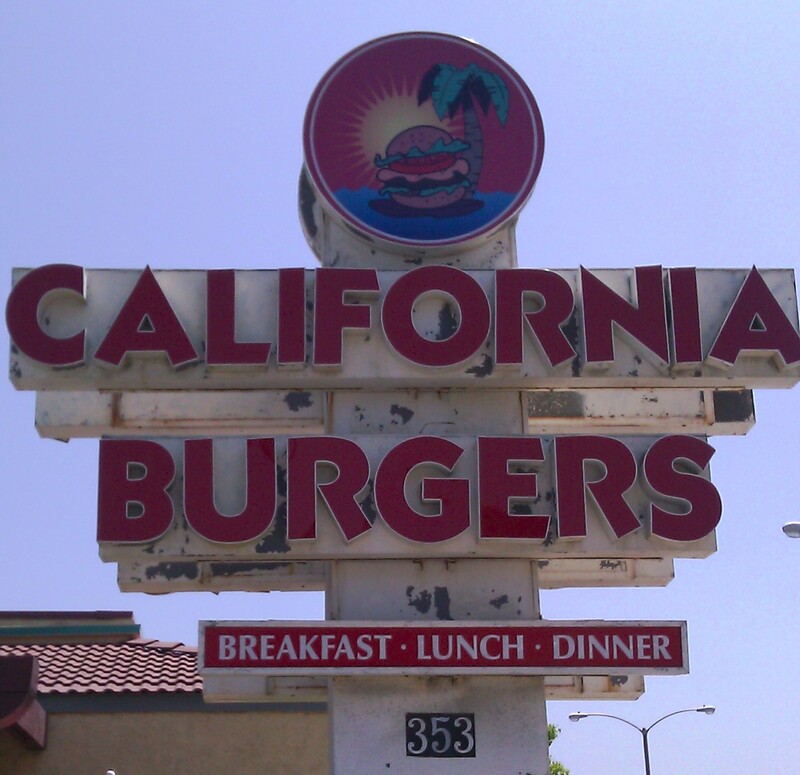 California Burgers was suggested as a good meeting place, so California Burgers it was. Parking was convenient and readily available in the ample lot, which surrounded the stand-alone restaurant. It was certainly a low-priced establishment. I fed 4 people for about 26 bucks (before tip). Our meals arrived in about 8 minutes. The Beef: Meh. The astonishingly thin burger patties had clearly been shipped to California Burgers in a frozen state. The cut was undoubtedly Chuck, and I assumed that it contained the standard 20% fat. The paper-thin burgers were rubbery, bland, and a little dry. The grill rendered off most of the fat from the 3.5 ounce patties. This further robbed them of moisture. The flavor was only mildly beefy. The Seasoning: There was no seasoning. The Sear: The gas-fired grill imparted some tame grill marks to the beef. The thin patties would have been impossible to sear properly without a ridiculously hot griddle. The Preparation: The perfectly circular, mechanically formed, beef discs were uniform in every way. 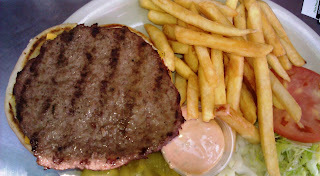 The beef was ground at a medium-fine setting, and the burgers were cooked to a rubbery Well-Done. The Cheese: My burger came with a slice of melted American cheese. The cheese was not noticeable in terms of texture or flavor. The blandness and dryness of the dish completely cancelled out the goodness of the cheese. The Bun: The bun was a bun, dryish, seeded, standard, hamburger bun. It was very nicely toasted, though. The toasted bun did provide a competent crunch. Sadly, this also served to further highlight the overall dryness of the dish. The Meat To Bun Ratio: The big, dry bun dwarfed the anorexic burger patty. The Fries: The fries were also previously frozen. The fries were properly cooked, and they were moderately crisp. They certainly lacked any earthy potato flavors, and they arrived unseasoned. The Toppings: The Iceberg lettuce was shredded and fresh. The tomato slices were tough and under-ripe. 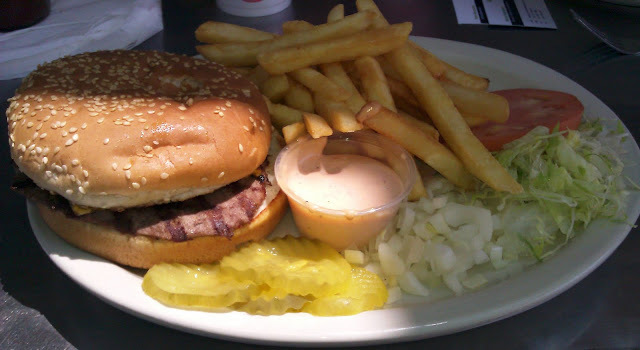 The Value: California Burgers charged a meager $4.69 for the Cheeseburger Combo. This included fries and a large beverage. While the food was bland and cheap, it was also filling. When I considered the low cost of the meal, the value was average. I assumed that this restaurant catered to a student crowd. California Burgers in Azusa, CA did not serve up a burger that I would want to eat again. The ingredients were average to below average in quality, and the quality of preparation was nominal. The flavors...there were no flavors to really speak of.